Technology and innovation have long played a key role in China’s reform and opening up. Even though it was a latecomer to the global scene, China has breathed life into its technology sectors by establishing a number of tech zones. Zhongguancun was the first such zone. It’s now the vibrant innovation hub in Beijing known as China’s Silicon Valley. Watrix is a star startup in Beijing’s Zhongguancun, which has world-leading technology of Artificial Intelligence (AI) that can identify people from up to 50 meters away no matter if they cover their faces or wear different clothes – just by body shape and how they walk. Huang Yongzhen is the founder of Watrix. He earned his Ph.D. in AI from the Chinese Academy of Sciences and decided to commercialize the technology. “I hope Watrix can become a leader of innovation in a certain field, to use our technologies and our spirit of opening and innovation to lead the changes in traditional industries,” Huang said. The technology has been used in security, defense and many other areas. Lenovo CTO and SVP, George He heads the Lenovo Capital and Incubator Group, one of the earliest investors in Watrix. The new VC arm of tech giant Lenovo has invested in many new tech startups besides Watrix, in such areas as AI, cloud, and big data. “I think it’s time, these engineers and scientists from the Institute of Computing Technology of Chinese Academy of Science are expecting that the technology they developed can build a product for Chinese people. I think that’s the key driver,” He said. The spark of innovation can be traced back to the 1980s. Lenovo was among the first start-ups in Zhongguancun and came in response to economic reforms that swept across the country in 1978. Lenovo was spun off from China’s Academy of Science and started by a group of scientists and engineers, with just 200,000 yuan (about 28,935 U.S. dollars) in original capital. “Our first product was the Lianxiang Chinese card, allowing IBM PCs to input process and output Chinese characters. That’s the cornerstone for Chinese people to use PCs,” He added. Meanwhile, he also noted tremendous changes have taken place in the past 40 years, and now is the best time for China’s tech start-ups and entrepreneurship. “There are so many changes, compared with 40 years ago. I think it’s great time; you have the money, the environment and the government policy support. And also you have a lot of talent, not only from China, these graduate students but also a lot of overseas students are coming back. It’s so different, huge differences,” He signified. Starting from just a handful of tech startups, Zhongguancun has turned into a vibrant tech hub for China. Last year, its total revenue reached 3.5 trillion yuan. The spirit of opening and innovation has also thrived. “All people working in the high tech industry, especially in AI, all called for more opening and sharing. Only through cooperation and win-win, making the whole human society as a community with a shared future, can humankind develop faster. History has proved isolationism won’t work, and will cause setbacks,” Huang cited. China’s reform and opening up policies have brought tremendous advances to China’s tech space. The past 40 years have witnessed the growth of Lenovo, and other major tech companies. With continued reform and opening-up, many start-ups such as Watrix, will become the new cornerstones of China’s innovation drive and technology upgrade. Chinese authorities have begun deploying a new surveillance tool: “gait recognition” software that uses people’s body shapes and how they walk to identify them, even when their faces are hidden from cameras. Already used by police on the streets of Beijing and Shanghai, “gait recognition” is part of a push across China to develop artificial-intelligence and data-driven surveillance that is raising concern about how far the technology will go. Huang Yongzhen, the CEO of Watrix, said that its system can identify people from up to 50 meters (165 feet) away, even with their back turned or face covered. This can fill a gap in facial recognition, which needs close-up, high-resolution images of a person’s face to work. Chinese police are using facial recognition to identify people in crowds and nab jaywalkers, and are developing an integrated national system of surveillance camera data. Not everyone is comfortable with gait recognition’s use. Shi Shusi, a Chinese columnist and commentator, says it’s unsurprising that the technology is catching on in China faster than the rest of the world because of Beijing’s emphasis on social control. The technology isn’t new. Scientists in Japan, the United Kingdom and the U.S. Defense Information Systems Agency have been researching gait recognition for over a decade, trying different ways to overcome skepticism that people could be recognized by the way they walk. Professors from Osaka University have worked with Japan’s National Police Agency to use gait recognition software on a pilot basis since 2013. Watrix’s software extracts a person’s silhouette from video and analyzes the silhouette’s movement to create a model of the way the person walks. It isn’t capable of identifying people in real-time yet. Users must upload video into the program, which takes about 10 minutes to search through an hour of video. It doesn’t require special cameras — the software can use footage from surveillance cameras to analyze gait. Huang, a former researcher, said he left academia to co-found Watrix in 2016 after seeing how promising the technology had become. The company was incubated by the Chinese Academy of Sciences. Though the software isn’t as good as facial recognition, Huang said its 94 percent accuracy rate is good enough for commercial use. Associated Press video producer Olivia Zhang contributed to this story. Chinese computer vision startup Watrix AI announced on Tuesday that it has raised 100 million yuan ($14 million) in its pre-A round of fundraising to accelerate the application of gait recognition technology. Gait recognition is a technique that integrates computer vision, pattern recognition and video processing to identify people by analyzing their body shape and walking posture. The fresh round of financing is led by Shenzhen Hang Bong Investment and Development Co Ltd and Hua He Capital. Huang Yongzhen, founder and CEO of Watrix AI, said that the fundraising will be mainly used for the research and development of product and technology, marketing as well as attracting talent. “We will spare no effort to explore more advanced technologies to step up the application of gait recognition technology. We aim to gain a lead in industrial visual sector,” he said. Watrix AI, founded in 2016, was incubated by the Institute of Automation of Chinese Academy of Sciences. The startup, focused on gait recognition, can provide solutions for sectors including security, transportation and manufacturing. According to the company, it is the only company in the world that can achieve cross-view gait recognition with an accuracy rate of 94 percent. Other recognition technologies aim to fill the gaps where facial recognition is currently unable to identify people. The government is also building a database of voice patterns to be able to identify people based on the way they talk. Another method is through a person’s walk. Gait recognition technology is able to identity people at further distances, and doesn’t rely on a person not covering their face. This technology is being developed by Watrix, who say they have developed the most advanced commercially applicable recognition techniques in the world. The company is currently cooperating on a small scale with local police forces to see how the technology can be implemented, the company’s CEO Huang Yongzhen, 34, said, adding that many other police forces were in contact with them. An employee at the firm said the police force was currently testing the technology on prisoners. Like Xu, Huang deflected concerns about what his technology could do if misused. “Before we had this technology, human skill was being relied upon to do these things, it’s just that with the technology it becomes more efficient… if you want to solve these concerns, the key doesn’t lie with the tech companies,” he said. 13 ноября в китайском городе Гуанчжоу на воду спустили первое в мире грузовое судно с электромотором. Грузоподъемность — 2000 тонн. Вместо топливного бака — гигантский литиевый аккумулятор весом 26 тонн. Заряда хватает на 80 километров пути — вроде мало, но таких маршрутов в мире много. Называется “каботажное плавание” — вдоль берега по морю от порта к порту или по реке. Судно сравнительно небольшое — длина 70,5 метра, ширина — около 14 метров. Экипаж — 6 человек. Пока водный электрогрузовик будет работать на реке Чжуцзян. Для пассажиров водный электротранспорт в Китае уже конструируется. Это лишь один пример, когда Китай делает свой технологический прорыв. Раньше во всем мире ворчали, мол, китайцы ничего своего не делают — только патенты воруют, сейчас все иначе. Китай — одна из ведущих технологических держав мира. Там, например, ходят самые быстрые пассажирские поезда на планете. Особый интерес в Китае вызывает космос. В августе прошлого года Китай запустил на орбиту первый в мире спутник квантовой связи. А недавно Корпорация аэрокосмической науки и техники Китая опубликовала сверхамбициозную дорожную карту по развитию космической транспортной системы до 2045 года. В ней и освоение Марса, и создание ядерного двигателя для вывода аппаратов на космическую орбиту. Еще одна важная сфера — безопасность. Уже сейчас китайские полицейские имеют доступ к 176 миллионам камер по всей стране, а инженеры-программисты работают над улучшением системы распознавания людей и выявления преступников. Как Китай уже использует искусственный интеллект? Черные комбинезоны, капюшоны — для чистоты эксперимента, люди — как тени. Не разглядеть телосложение, тем более лицо. Но этот взгляд видит все насквозь. Задача — понять, кто из людей прошел перед камерой, пряча лицо. Умная система не ходит вокруг да около. Участники сделали целый круг, но программе хватило бы 200 миллисекунд — вдвое быстрее, чем моргнуть — чтобы считать рисунок походки, столь же уникальный, как отпечаток пальца или радужка глаза, уверяет профессор Мухаммад Рауф, один из разработчиков. “Походка у каждого своя: по-разному перемещаются руки и ноги, кто-то сильно опирается на носок, кто-то двигается очень резко. Мы учим алгоритм распознавать и запоминать эти особенности. Если вы захотите обмануть систему и измените походку, она, может, не идентифицирует конкретно вас, потому что это не ваша обычная походка, но поймет, что вы двигаетесь нарочито неестественно, и сигнализирует, что видит что-то подозрительное”, — пояснил Рауф. Неважно, какая одежда, — сканер видит силуэт и сличает его с базой данных. Каждый человек — это то, как он двигается: в систему можно, например, загрузить походку всех домочадцев, и если в комнате появится посторонний, сработает сигнализация. Плюс массовая безопасность: ученые уверяют, что распознать в толпе можно до тысячи человек, ведь им не нужно быть близко к камере. “Человек может находиться на расстоянии до 50 метров, а если мы используем камеры с высоким разрешением, то еще дальше. Точность распознавания — до 95%, и чем лучше оборудование, тем выше результат”, — рассказал Мухаммад Рауф. Телешоу не просто эксперимент — соревнование: система против эксперта по биометрии. Победитель очевиден — в Китае сделали ставку на искусственный интеллект. Камер наблюдения — уже 176 миллионов. И на их счет у китайских властей далеко идущие планы, которые сейчас кажутся фантастикой: поставить искусственный интеллект на службу полиции и общественной безопасности. До 2030 года на это готовы потратить 150 миллиардов долларов. Электронная маска — как виртуальный слепок лица. Настолько точный, что различает даже близнецов. Более 200 точек — все не скроешь ни очками, ни гримом. Маску тоже видно — от ткани иначе отражается свет. В крупнейшей компании по разработке оборудования по распознаванию — с оборотом в 460 миллионов долларов — реальностью сделали голливудскую фантастику, там это называлось pre-crime – “предсказание преступлений”. “Человек может не числиться в базах данных преступников. Но при этом он появляется в определенных местах слишком часто. По сигналу полиция может остановить его и проверить. Он может оказаться, например, вором, который постоянно крутится на вокзале в надежде поживиться чьим-то бумажником”, — сказал Се И Нань, вице-президент компании-разработчика. Покупка молотка или кухонного ножа полицию, конечно, заинтересует вряд ли, а вот завсегдатаи оружейных магазинов вполне могут попасть под подозрение. Система уже объединяет более полусотни городов и провинций. Так, в сентябре на крупнейшем фестивале в Циндао задержали 25 преступников, один из которых был в розыске более десяти лет. Они сменили имена и паспорта, но не лица. А недавно полиция нашла пропавшего ребенка — камеры распознали девочку и ее похитителя. Операция заняла всего 5 часов. Впрочем, такая система — это не только безопасно, но и удобно. Покупки за селфи — регистрация занимает всего минуту. Вместо охранников и продавцов — камеры, вместо кассира — умный сканер. Не заплатил — не ушел: пока деньги не списаны — дверь заблокирована. Все больше магазинов, которые не только знают клиентов в лицо, но и верят на слово. Идентификация по голосу — уже собраны десятки тысяч образцов. В Ханчжоу запущен сервис “оплата улыбкой” — в ресторане достаточно мило поприветствовать сканер и нажать кнопку подтверждения. Банкоматы не выдают деньги, пока не разглядят просителя и не сравнят с фотографией в паспорте. Понятно, что во избежание ошибок и спекуляций пароли и коды никто не отменял, но факт: теперь лицо — это ключ. Есть и совсем необычное применение: в Шэньчжэне камеры ловят идущих на красный свет и выводят их имена и фотографии на электронную доску позора. Эффект налицо: нарушать стали в 10 раз меньше. А в пекинском парке таким способом борются с расходом туалетной бумаги: одному и тому же лицу можно взять ее только раз в 9 минут. Есть, конечно, ограничения — освещение, ракурс. Нужно четко проработать и правовую базу: пока по закону все инновации — лишь дополнительный способ идентификации. Но развитию отрасли способствует бум селфи и соцсетей — есть возможность анализировать огромное число изображений. Объем этого рынка в Китае превысил миллиард юаней. Ожидается, что за 5 лет вырастет еще в пять раз, и уже очевидно, что высокие технологии могут уйти очень далеко. Die Regierung in Peking schirmt die heimischen Internetkonzerne vor ausländischer Konkurrenz ab. Doch das erklärt ihren steilen Aufstieg nur zum Teil. Frei­tag­abend, 20 Uhr, Prime­time in Chi­nas Staats­fern­se­hen. Im ers­ten Pro­gramm be­ginnt eine gro­ße Un­ter­hal­tungs­show, die seit Mo­na­ten Mil­lio­nen vor den Bild­schirm lockt: „Ji zhi guo ren“, wört­lich: „Ma­schi­nen­weis­heit ge­gen den Men­schen“. Chinese computer vision startup Watrix recently unveiled its gait recognition product which will enable security departments to quickly search and recognize identities, making it one of the world’s first commercialized products for gait recognition. The latest product is highly effective when targets walk from a long distance or in weak light, cover their faces or wear different clothes, and will be a great supplement to current computer vision products. “The product will greatly improve efficiency in security-related areas including police, customs and ports as it is able to scan a one-hour video and identify objects within 10 minutes, with the accuracy rate reaching 94 percent,” said Huang Yongzhen, CEO of Watrix. It has been tested by public security officials for more than 1,000 hours and has been involved in the detection of more than 20 cases. Huang disclosed that the company has already obtained intent orders totaling more than 135 million yuan ($19 million). Watrix, which was founded in 2016, was incubated by the Institute of Automation of the Chinese Academy of Sciences. The startup, focusing on computer vision, can provide solutions for sectors including security, transportation and manufacturing. It raised 100 million yuan in its initial round of fundraising earlier this month, with Shenzhen Hang Bong Investment and Development Co Ltd and Hua He Capital leading the investment. “The technology has been commercialized in an array of fields including safety and security, as well as transportation. It is a promising market that is able to nurture companies valued at some 10 billion yuan or even 100 billion yuan,” said Zhou Shuhua, founding partner of Hua He Capital. The startup also launched an intelligent searching machine to help railway staff detect flaws in railways as well as other abnormalities, which can help reduce maintenance costs by around 60 million yuan from each machine. Beijing-based high-tech company released a security product on Friday using gait recognition technology to search for targets, which is likely to assist China’s public security department in identifying suspects. 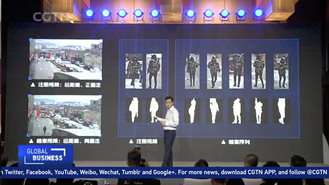 Developed by WATRIX, this product, called “Shuidi Shenjian” can target suspects by monitoring their posture as the suspects walk from a distance of up to 50 meters. Different from facial recognition, the gait recognition technology is more flexible. 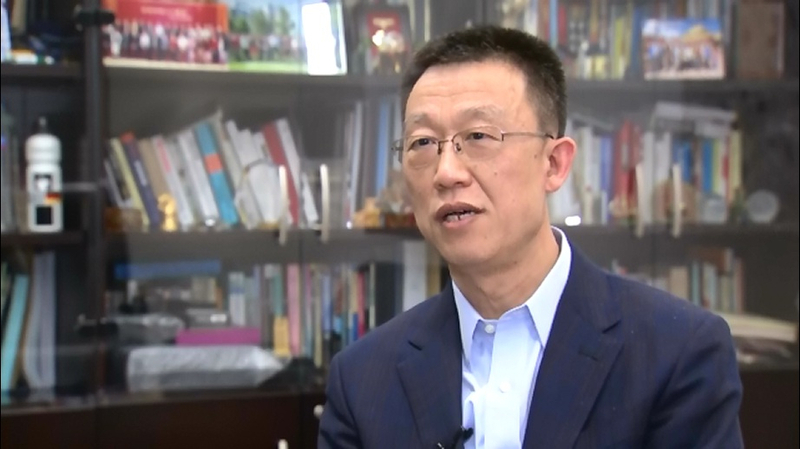 It is capable of identifying targets from any angle regardless of if they cover their faces or wear different clothes or walk outside at night, without suspects being aware, Huang Yongzhen, CEO of the WATRIX, told the Global Times on Friday. Huang said that the company had inked deals with public security departments in Beijing’s Fengtai district and Shanghai. The public security department in Xinjiang also expressed interest in the security product. The portable machine, weighing about 15 kilograms, can replace manual workers by quickly spotting suspects while they are walking. Users need to upload videos onto the machine first and offer the machine an example video of the target, then the machine can complete a search through one hour of video in 10 minutes. Its accuracy is about 94 percent. But Huang said the technology still cannot detect targets in real-time videos, which is the next step of their research. At present, the product has been piloted in the public security system for more than 1,000 hours, being used in the detection of more than 20 cases. It had retrieved 2,000G of public security videos so far. The gait recognition technology can also be applied in the medical field by allowing medical personnel to examine whether a patient has fallen down and it can also be applied in oil fields to seek out intruders, as well as being used in designing smart home furniture, Huang noted. 701, ShouXiangKeJi Building, No. 51 Xueyuan Rd, Haidian Dist., Beijing, China.